(Nanowerk News) Last week, the U.S. Patent Office issued patent #8,327,721 to HP for 'sensor fabric for shape perception". 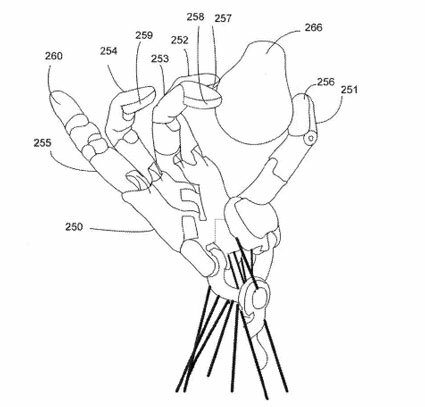 A schematic depiction of a robotic hand using sensor fabric patches on its finger tips for touch sensing. Robotics has come a long way since the word "robot" was coined in the early twentieth century. Nevertheless, it is still a challenge to replicate or mimic some basic human sensory functions in robotic devices. For instance, it has been very difficult to mimic the sense of touch. While a human hand can easily sense the shape of an object and other attributes such as temperature and stiffness by simply touching the object, it has not been an easy task for sensors in modern robotic devices to obtain shape information by touch. Some prior attempts for shape perception by touch are based on MEMS devices for electro-mechanical responses. Such sensing devices have many issues. They are bulky and complicated, and produce small signals that require highly sensitive signal amplification for detection. As a result, they are hardly useful for integration into systems of interest, such as robotic hands. A sensor fabric for touch sensing has a plurality of flakes of a flexoelectric material and electrodes as threads for connecting the flakes together. Each flake has at least one pair of opposite edges connected by two separate electrodes. When the sensor fabric is placed in contact with the surface of an object, the flake is bent along the contour of the object surface. The bending of the flexoelectric flake generates a polarization voltage between its opposite edges, which can be measured via the electrodes to determine the local surface contour of the object.